We’d love your help. Let us know what’s wrong with this preview of The Craft Kingdom by Eli Maor. Crafting and making art is very individual. These moments are completely yours. Even if you don’t have access to all of the materials, you can be creative and experiment. If you prefer to use one type of material over the other, or if you prefer glue over sewing, do so. The main purpose is to enjoy it and create your vision at every moment. There is no need for any special Crafting and making art is very individual. There is no need for any special skills for the projects in this book. However, those who sell artwork and wish to obtain the maximum results should stick to the projects and supplies as written. With that being said, there is no right or wrong way to craft and to make art, it comes down to having fun and express yourself. This book contains 92 DIY, crafts and art projects. Under each category, you will find the required supply for each project and a tutorial. At the end of the book, you will find stencils that will help you trace shapes and silhouettes for the projects. To ask other readers questions about The Craft Kingdom, please sign up. I love Eli Maor! I love this book! So loaded with great ideas I don't know where to begin... I loved the coffee cups painted in nail polish-very original! Also re-doable! Change them seasonally, or by holiday, or whim! Decorating with washi tape was irrisistable;. I can't wait to use it on some item when I redecorate. Soap making, toilet paper tube art, hair jewelry... this book is loaded with cool stuff for kids and adults to make! Photos are really helpful, too. It would make a cool gift for a I love Eli Maor! I love this book! So loaded with great ideas I don't know where to begin... I loved the coffee cups painted in nail polish-very original! Also re-doable! Change them seasonally, or by holiday, or whim! Decorating with washi tape was irrisistable;. I can't wait to use it on some item when I redecorate. Soap making, toilet paper tube art, hair jewelry... this book is loaded with cool stuff for kids and adults to make! Photos are really helpful, too. It would make a cool gift for a crafter. One of the best ways to spend time together - with family, with a child, with friends - is when everyone is working on a project together. Keeping hands busy seems to allow the conversation to flow. Crafting has been a way to create this working together environment since time began. But, how do you get started and what can you create together? Eli Maor has provided a wealth of ideas in her book "The Craft Kingdom: DIY and Craft Projects for Kids and Adults". I received a copy of the book throug One of the best ways to spend time together - with family, with a child, with friends - is when everyone is working on a project together. Keeping hands busy seems to allow the conversation to flow. Crafting has been a way to create this working together environment since time began. But, how do you get started and what can you create together? 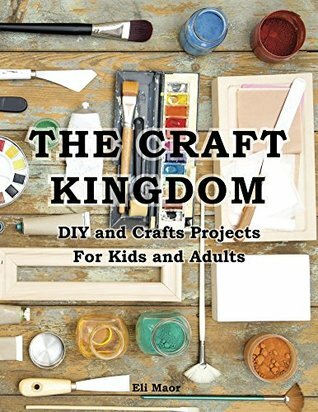 Eli Maor has provided a wealth of ideas in her book "The Craft Kingdom: DIY and Craft Projects for Kids and Adults". I received a copy of the book through NetGalley to provide a review and I was impressed with the large number of projects. Maor has a new project idea on each page of The Craft Kingdom. The book is chock full of ideas that use a wide variety of tools and raw materials. You can choose from simple paint projects, to decorative wood projects. Materials can be new or recycled. The colorful photos and step by step instructions can help you and a child to create a wide variety of decorative or functional household items that you can use or give as gifts. In addition, the author's YouTube channel can provide additional inspiration or more detailed steps. Not all of the projects show illustrations of the step by step instructions, which I would appreciate as a visual leaner. However, each has detailed written instructions and a list of project materials. Those totally new to crafting may wish for more detail, but the projects are all fairly simple and easy enough to do with your child. I would caution, however, that adult supervision is necessary for most of the projects given the use of tools such as scissors, hot glue guns, sewing tools, etc. I am giving this title four instead of five stars as I think many new crafters could use a bit more visual instruction. Any YouTube videos that tie in with the book crafts would be greatly appreciated. Go through your recycling bin and see what you could make…bangles from plastic bottles, a vase from a Pringles tube, gift boxes from toilet-roll middles. ‘The Craft Kingdom’ is all about things you can make using items you have at hand. The book has large colourful photos and straightforward instructions and includes sections on making soap, candles and jewellery as well as lots of ideas for using everyday items. It’s not a thick , encyclopedic craft book with advanced techniques, and the projec Go through your recycling bin and see what you could make…bangles from plastic bottles, a vase from a Pringles tube, gift boxes from toilet-roll middles. ‘The Craft Kingdom’ is all about things you can make using items you have at hand. The book has large colourful photos and straightforward instructions and includes sections on making soap, candles and jewellery as well as lots of ideas for using everyday items. It’s not a thick , encyclopedic craft book with advanced techniques, and the projects are not as sophisticated or aspirational as those put out by the big commercial names. But if you’re looking for fun, easy projects that all the family can enjoy, this is the book for you. Many thanks to Eli Maor and also NetGalley for the copies to review. While the glue is drying on my bottle, I just want to say... For someone who wants to get into crafts, or to branch out into out kinds of ways to express your creative side, this little book is a gem. There isn't one theme to the book except that it is dedicated to a lot of different crafts that you can get to in-depth after this great introduction to it. It has very clear instructions on how to do the projects and still gives you room to personalize it, make it your own. A lot of the materials While the glue is drying on my bottle, I just want to say... For someone who wants to get into crafts, or to branch out into out kinds of ways to express your creative side, this little book is a gem. There isn't one theme to the book except that it is dedicated to a lot of different crafts that you can get to in-depth after this great introduction to it. It has very clear instructions on how to do the projects and still gives you room to personalize it, make it your own. A lot of the materials you need are available in your local craft store, grocery story or your own pantry. And it's also great how most of the projects here want to to reuse something. The Craft Kingdom by Eli Maor will be a treasure to all those OCD organizers and craft supply hoarders out there. I know I have plenty in my boxes and bins to have a blast making quite a few of the 92 projects in this book. I kept saying "OOH" and "Neat" as I scrolled through the ideas Eli Maor offers in this surprising treat. Full Disclosure: I was allowed to read a copy of this book for free as a member of NetGalley in exchange for my unbiased review. The opinions I have expressed are my own an The Craft Kingdom by Eli Maor will be a treasure to all those OCD organizers and craft supply hoarders out there. I know I have plenty in my boxes and bins to have a blast making quite a few of the 92 projects in this book. I kept saying "OOH" and "Neat" as I scrolled through the ideas Eli Maor offers in this surprising treat. I received a free copy of this book and voluntarily chose to review. I loved how the author laid out the crafts step by step. I can't wait to begin making these projects. I like doing crafts, but I'm definitely at a beginner level. Fun for everyone. There is quite a bit packed in this book. It is a great resource for a variety of information about crafts. I received a kindle version of this title and I thought it was an interesting idea, but the formatting was not very good. I really enjoyed that there was a lot of different ideas for creating crafts with everyday materials that a reader can make another use for. There were quite a few ideas that seemed outdated and not as new as the many ideas from Pinterest. 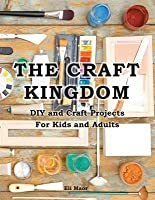 This would probably be a good book for a young adult interested in starting crafts and need less screen time. I like a good craft project, and I like to think I’m reasonably handy at “making things” - I actually make some of my own clothes. What I am not, however, is an artist. Like, at all. Seriously, no artistic skills whatsoever. Can’t paint, draw, sculpt, or anything else along those lines. But The Craft Kingdom looked like a lot of fun, so I requested it on Netgalley. I can’t say I thought it would turn me into Picasso, but hey, I can always stand to learn some new skills! I decided the best way to I like a good craft project, and I like to think I’m reasonably handy at “making things” - I actually make some of my own clothes. What I am not, however, is an artist. Like, at all. Seriously, no artistic skills whatsoever. Can’t paint, draw, sculpt, or anything else along those lines. But The Craft Kingdom looked like a lot of fun, so I requested it on Netgalley. I can’t say I thought it would turn me into Picasso, but hey, I can always stand to learn some new skills! Ashley and I had a lot of fun, and I really enjoyed The Craft Kingdom. The photography is well-shot, and the images of Eli Maor’s work are beautiful and inspirational. I can’t say that Ashley and I managed to achieve anything nearly so good, but the pictures did make it seem like it might be possible. It was one of those books that was so pretty, it was just a pleasure to flip through. I thought there was a great range of crafting activities, with something for every skill level. And some of the activities were quite unique, I would never have thought of them, which was interesting. I also really liked that you didn’t need any particular equipment or materials to make most of the projects. The ends were completely achievable with household or commonly used items, which I think is a real USP for The Craft Kingdom. Some of the language needed an edit, as the sentences were a little run on, or structured oddly, and there was the odd typo. However, it was clearly written by Eli Maor, and definitely had the character of the artist, so the occasional language snaffoo didn’t affect my enjoyment of the whole too much. The instructions were clear, and the descriptions were easily understood. I also thought the introduction at the beginning of the book was very touching; so much so, I think I had already decided I would like this book, just based on that. This book gave two somewhat-adults a great afternoon, and would be equally fantastic for children. I highly recommend it for anyone looking for something a little different to do on a rainy afternoon, or a way to entertain small people during the holidays. And if you have any actual talent for this stuff, I think it might even be a great way to decorate your home inexpensively or give you some ideas for turning a hobby into a money-spinner. This book is filled with so many different projects! Most would be good to do on an afternoon. Many things can be found around the house and outside which is fabulous for those not wanting to spend a lot of money. Great book! I received this book from netgalley.com for a honest review. What a wonderful book, full of very simple and easy to make ideas, yet at the same time extremely modern and effective both in the home or as gifts. The supplies are either very easily sourced or available around the house. A book that children would be able to follow and make and an adult would be proud to make and use.